Did you know that this week (15 - 21 May 2017) is National Vegetarian Week? It’s all about eating veggie for the week and enjoying delicious, exciting food. Everyone is welcome to join in and the website has got loads of mouth‑watering recipes, tips and resource packs to help you make the most of it. Click here to visit the website. 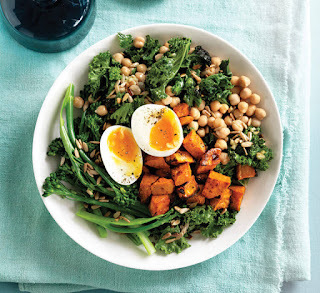 Why not try something like this tempting Sweet Potato, Chickpea and Egg bowl - click here for the recipe.